The grim situation of Rohingya Muslims in Myanmar further intensified on Sunday as Bangladesh refused to allow those fleeing from violence. The reports said that the neighbouring nation has detained and forcibly returned 90 Rohingya migrants to Myanmar just hours after Myanmareese troops on the other side of the border had opened fire on people fleeing the country. The Myanmar Government and the country’s Muslim Rohingya ethnic minority have been engaged in an armed clash, which has resulted in the death of 96 people, mostly alleged Rohingya attackers but also 12 security personnel, an official announcement said. The announcement was the first by the government to list civilians among the dead—six people identified as Hindu said to have been killed by the insurgents.Myanmar is overwhelmingly Buddhist, but about 1 million Muslim Rohingya live in the northern part of Rakhine, the western state where the violence is taking place. Senior Rakhine state officials who visited the troubled area said in the evening that government forces were trying to restore peace. The two men spoke to reporters in the state capital, Sittwe, in the southern part of the state, far from the fighting. They also said the government was trying to protect members of international aid organizations in the area, or evacuate them if they desired. The government has allowed only a limited number of foreign aid organizations to work in northern Rakhine state, and due to long-standing communal tensions, some Buddhists resent their helping Rohingya. A Rohingya insurgent group, the Arakan Rohingya Salvation Army, or ARSA, took responsibility for Thursday night’s attacks on more than 25 locations, saying they were in defense of Rohingya communities that had been brutalized by government forces. Clashes were continuing today, with witnesses contacted by phone in the northern Rakhine town of Maungdaw saying they could hear gunshots. On Friday, the government declared ARSA a terrorist organization, which means most contacts with it are illegal. Witnesses and refugees on the Bangladesh border said that the situation there was tense, with thousands of Rohingya trying to flee Myanmar but unable to leave. Witnesses said they heard the sound of gunshots. Bangladeshi villagers said they could see military helicopters hovering in the Myanmar sky. Several hundred Rohingya got stuck in a “no man’s land” at one border point in Bangladesh’s Bandarban district, barred from moving farther by Bangladeshi border guards. Lt. Col. Manzurul Hasan Khan of Border Guards Bangladesh said they cordoned off about 1,000 Rohingya after they attempted to enter Bangladesh. 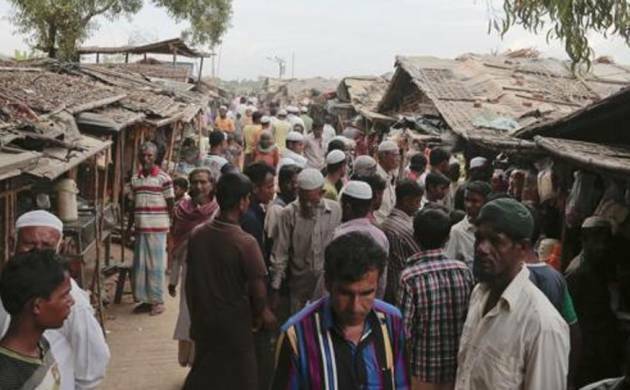 Still, more than 2,000 Rohingya entered Bangladesh overnight through two points at Teknaf in Cox’s Bazar district, said Jalal Ahmed, a local government official at the Kharangakhali border point. In reponse, Bangladesh Police intercepted a group of 70 Rohingya late Saturday after they crossed the “zero line” border zone, where Myanmar soldiers earlier fired mortars and machine guns at villagers making the dangerous dash from the northern state of Rakhine into Bangladesh. “All 70 were detained and later pushed back to Myanmar by the border guards,” Khaer told AFP. Police said some of those detained had entered Bangladesh via the Ghumdhum border area—where the Myanmar forces unleashed the barrage of fire just hours earlier. “They were pleading with us not to send them back to Myanmar,” said one policeman on condition of anonymity. Another 20 Rohingya were caught Sunday and sent back after crossing the Naf river, a natural border between Myanmar and Bangladesh, according to Ariful Islam, a commander with Border Guard Bangladesh (BGB). Thousands of Rohingya have fled towards Bangladesh, but authorities there have refused to let most of them in, with an untold number of people—mainly women and children— stranded along the border zone. Officials in Cox’s Bazar, the district bordering Myanmar that is home to several large refugee camps, have been instructed not to allow any “illegal entry” by Rohingya, Abdur Rahman, a senior government official, told AFP. “They fired so close that I cannot hear anything now,” 70-year-old Mohammad Zafar said of armed Buddhists who shot dead his two sons in a field.“They came with rods and sticks to drive us to the border yelling, ‘Bengali bastards’”, Zafar told AFP. Rahima Khatun said she spent the night hiding in the hills after Buddhists in her village torched Rohingya homes and set upon men with machetes and clubs.“We grew up with them. I can’t figure out how they could be so merciless,” she told AFP. The Myanmar Government refuses to recognize Rohingya as a legitimate native ethnic minority, calling them Bengalis to reflect the position that they are mostly illegal immigrants from neighboring Bangladesh. Most Rohingya are denied citizenship and its rights. Despite years of persecution, the Rohingya largely eschewed violence.But in October ARSA attacked a string of Myanmar border posts, sparking a military crackdown that left scores dead and forced 87,000 people to flee to Bangladesh. Northern Rakhine has been stalked by violence since then, with civilians trapped between security forces and the militants—who are accused of conducting a shadowy assassination campaign against perceived collaborators with the state.